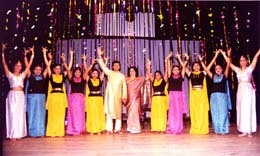 "...Manick Sorcar and his cast of 50 mesmerized the audience throughout the two hour show. It seemed the audience did not want to leave - they wanted more of Manick's amazing production....Aside from his incredible laser fantasy of India Forever, Manick skillfully and artfully combined magic with traditional Indian dances, colorful props, wonderful cast. 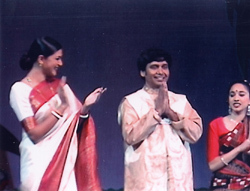 One has to see it to truly enjoy his unbelievable production.."
who participated in his production. Manick Sorcar has been producing and directing stage shows for several decades now. Only in the past few years has he combined his love for the arts and knowledge of engineering through laser technology to create multimedia performances that have taken audiences of the world by storm. His shows are an extravaganza of dance, drama, magic and laser animation in combination with live action through an exclusive process known as ‘SorcarScope.’ Many of his shows have been based on Indian themes to bring Indian culture into the limelight to the mainstream audience. Sorcar’s unique shows consist of a cast of over 50 professional and highly qualified performers ranging in a wide variety of talents and of different demographics.His daughter's Piya and Payal co-choreograph the dance performances. 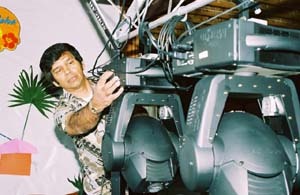 His shows can be customized to fit the needs of almost any event – small or large and are created for the whole family to enjoy. With no language barrier and through the use of high-tech illusions, his shows can transport viewers from their seats into a magical world. 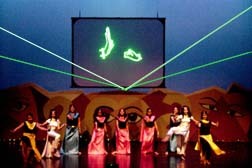 He is able to create a harmony between live action on stage synchronized with full-size laser-animated figures. Over the last few years Sorcar’s shows have reached many corners of the U.S. as well as India and Canada. He has also worked with and sponsored many non-profit shows to raise funds for charities around the world. He hopes to continue to bring forth high quality unique performances through the use of live action, animation, state-of-the-art technology and a glimpse of magic. Manick Sorcar Productions is looking for male and female dancers in the Colorado or California area with an expertise in modern, ballet, jazz, East Indian (classical, folk) or fusion dance styles. He/she should have ample stage experience and the ability to improvise creative movements. Selected troupe members will have the opportunity to travel worldwide, perform on television, and perform with, and be trained by world-class performers. Manick Sorcar productions provides an amazing opportunity to network and gain much exposure into the world of theater and arts. Currently, auditions will be held throughout the upcoming year.